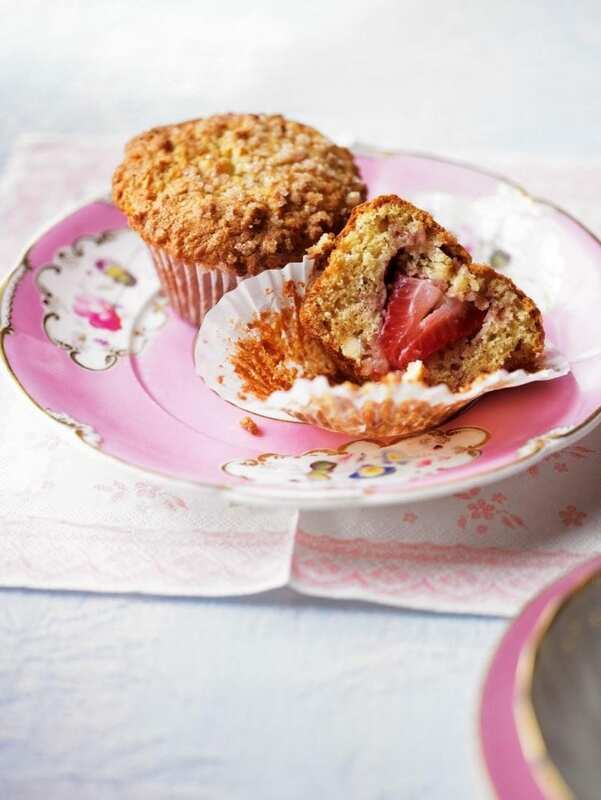 These may look like ordinary white chocolate muffins, but the centre holds a scrumptious surprise. Preheat the oven to 200°C/fan180°C/gas 6 and line a 12-hole muffin tin with paper cases. Mix the flour, bicarbonate of soda, caster sugar and chocolate in a large bowl with a pinch of salt. Beat together the eggs, melted butter, yogurt and milk, then stir briskly into the dry ingredients. Don’t worry if it’s a bit lumpy. It’s important not to over-mix, otherwise the muffins will lose their lightness. Divide the mixture among the cases, and then push a strawberry into each muffin, making sure it’s completely enclosed by the batter. Sprinkle with granulated sugar, then bake for 20-25 minutes until golden. Cool in the tin for 5 minutes before lifting on to a rack to cool completely.